It’s Grade Four Long Jump. Not The Answer To Stop World Hunger. I stand on the sideline of the long jump pit measuring the scores of each grade four girl, at the school athletics carnival. I smile and tell them well done and try to dismiss the obsessive parent in the background who insists in telling each girl their exact measurement, how far behind or in front they are from the previous girl and the exercises they need to do to be a better long jumper. Then, the teacher makes a crucial mistake. She asks for volunteers. That parent I was trying to ignore is now in my face, her necklace jangling and earrings swinging side to side. She’s bouncing up and down to be selected. She’s the only one volunteering. 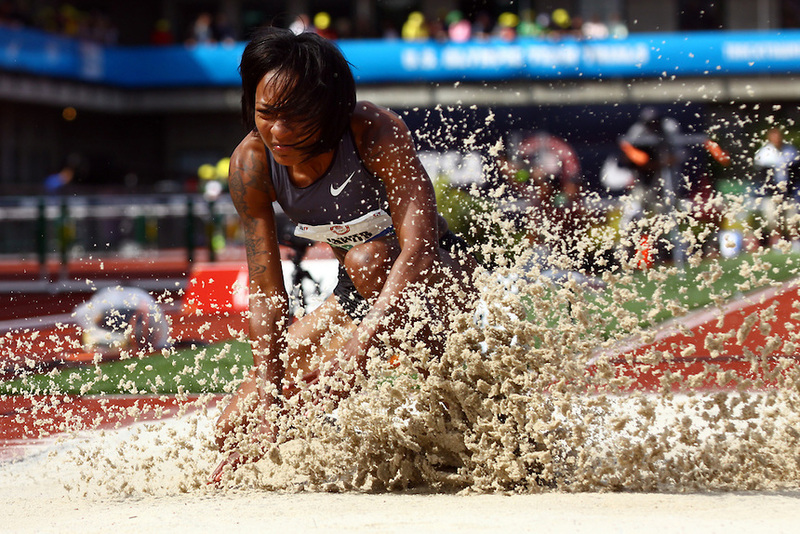 Now she has a job at the long jump. All she has to do is measure how long each girl jumps. Round it off to the closest centimetre and if you really want, millimetre. The first girl jumps, she starts measuring and for the next five minutes debates whether she jumped 1.02 metres or 1.03. Her two year old son, Miller (???) who is a great “helper”, jumps out in front of the girls each time they’re jumping. Miller, seems to have trouble to know what the word “no” means, but I am reiterated to that he is a great “helper”. The mother starts talking to me again, trepidation and excitement mixed in her voice. Her daughter is about to jump. Will she meet her PB? Oh, how nerve-racking? Her daughter jumps, and just like her brother Miller, doesn’t seem to understand me when I speak. This is where you’re meant to jump from. “I did not foul,” yelled the little girl! “I don’t think my Lily* fouled,” yelled the mother/volunteer. 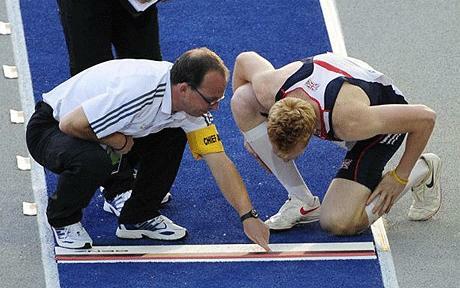 “I’m sorry but the rules are you have to jump before the white line. Lily jumped whilst she was in the sand. That is way over the line,” I informed them. This is where the little girl jumped from. This debate continued for another five minutes, arguing that we could just grant her with the benefit of the doubt. Eventually, the little girl stormed out of the pit (she actually walked to where she was meant to jump from, which I could technically measure her from there because that was the last footstep in the pit, but I didn’t because it wasn’t the OLYMPICS) and her mother ran over to the tantrum-ing little girl and reassured her that she was still the best – she would do better on the next jump. Once their little pep talk was over, the mother raced back over to me where the following conversation took place. “Yes. Yesterday, she was doing discus and she threw a really good shot but it was a foul, as well. The sports teacher there, Mr Clohe*, said that was the best shot he had ever seen and if it wasn’t a foul then it would have been the best discus throw ever. Because Grade Four discus would compare to something like the Olympics. This mother continued with her fascination of being the coolest, most knowledgeable and completely over-rated mum there. She compared kids in my grade with each other (how does she even know their names? Her own child is in grade four???) and went on to measure every jump to 1.03792 exactly. And she annoyed me. A lot. WHAT HAS HAPPENED TO THE WORLD? WHEN DID ANYBODY CARE IF A SEVEN YEAR OLD DIDN’T MAKE A PB? THEY’RE SEVEN? WHEN DID THEY EVEN GET A PB? Initially, I was just struck in absolute shock and then I became quite angry. These parents, these obsessed and pressuring parents, are become so fanatical with their child and minor achievements such as the extra 0.000001 they added to their long jump PB that one day, that child will just give up. That child will feel so much anxiety and pressure to win or get a PB that their fuse will just burn out and in turn, so will they. This constant obsession that our society seems for our children to be able to play Grade Five piano when they’re five, winning nationals for swimming, cross country and netball, academically receiving A++ in every subject and being socially perfect is just rubbish. I cannot understand why a parent would choose to inflict such pressure onto their child – such pain for a child to endlessly desire to live up to their parents’ growing, changing and heightening expectations and let their child run until the ends of the Earth just to please, but, nonetheless, it happens. I see it every day. I see what the parents want and what the child wants. I see the polar opposites trying to meet and then one day, everything that child has ever done and the person they have become is stripped. They get to a point where they can no longer cope with any pressure at all so they let everything go. Let your child grow up. Let your child lead their own life and nurture their talents, gifts and weaknesses. Your child should be the most beautiful thing in the world to you, no matter their PB in Grade Four long jump, and if you can’t appreciate them just as they are, then you’re not being a true parent. Did you know any parents who pressure their children? Do you do it? Why? Do your parents pressure you? When Did Society Start Opposing Others’ Achievements? A few weeks ago, my school attended a sustainable business conference, initiated for high school students to see alternative methods of doing business to achieve ultimate sustainability. One of the aspects to the program was each school being lectured on an individual topic and ours was Coal Seam Gas. At the end of the presentation, we were again split into groups of four to answer questions about Coal Seam Gas. The answers we submitted would be provided to a panel of judges who would select a winner from all the schools. Surprisingly, the group I was in were announced as winners of the business conference. We were the youngest students to attend the conference and have only just begun studying Business in school, compared to Grade 12s from other schools who have been studying for two to three years. Definitely a shock winning the conference, though, a very happy one. We donned our small prizes, caps and water bottles, and proudly walked back to school with our trophy. For the five minutes that we were oblivious to the world, being overtaken from immediate euphoria, we didn’t notice our fellow classmates snidely looking down on us. After being told “to get over ourselves”, we woke up and came back to Earth to see a sea of class members scowling at us and refusing to respond to our questions if anything was wrong. One girl turned around and gave us the finger. How endearing? We were quickly “put in our place” and shown that our “achievement” wasn’t even “that big”, according to them. Now, after years of bullying and many mistakes, I have learnt to quietly accomplish and not live off the accolades of others to feel successful, thus, when we were awarded the prized, I didn’t jump up and down and bombard people with my feelings of absolute accomplishment and joy. No, I smiled and congratulated the other group members for their prize and hard work. Yet, I was still told to “shut up” and “get real”. So, my question is, when did everyone reject the achievements of others? Has this always been the case or is our society forming into one of feeling cheated if another person wins or does better than you do? When did people just not accept that sometimes there will be a winner and a loser, or to not hurt their feelings anymore, almost winners? Sometimes there will be times when you feel like you deserved something more than other person, but life is not about winning all the time. Life is not about the end result but how you recover from it or enhance it. I still can’t believe how our classmates reacted to our achievement. We weren’t from an opposing school, we were on their team. We were meant to be their friends. I ask everyone to acknowledge that life’s not always fair but it is critical that we don’t reject our fellow mates, acquaintances, countrymen or whoever you are. Follow the well-known saying – “treat others how you want to be treated”, ensuring that when you are the one deserving praises for success, one isn’t “congratulated” with the back of another’s finger. Are you happy for other people’s achievements? Have you encountered negative response to accomplishment?